View Dr. Usha Rajagopal’s amazing transformations with abdominoplasty (tummy tuck). Abdominoplasty, known more commonly as a “tummy tuck,” is a major surgical procedure to remove excess skin and fat from the middle and lower abdominal wall and to tighten the abdominal muscle. 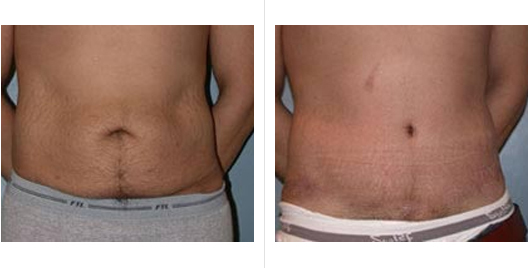 The procedure can dramatically reduce the appearance of a protruding abdomen. So maybe you’ve been counting those Weight Watchers points, and have trimmed down substantially, but still have hanging skin and fat around your belly. Or you’ve realized that even eating veggie Subway sandwiches for three of your three meals isn’t going to get rid of your post-pregnancy bulge. Maybe you just don’t want to put off looking great in a bathing suit one summer longer! If this sounds like you, you may want to consider getting a tummy tuck, or abdominoplasty. Abdominoplasty tightens the abdominal muscles and gets rid of excess skin and fat. The surgery is typically performed on individuals who have had major weight loss but still have excess hanging skin and fat around their belly. Women whose abdomens have never returned to their normal state after a pregnancy also benefit greatly from a tummy tuck. A tummy tuck will generally take place in a surgeon’s facility or in a hospital. It will take between two and five hours depending on the procedure. General anesthesia may be administered. You and your surgeon may also decide to use a local anesthesia combined with a sedative. There are two primary types of tummy tucks. You and your surgeon will decide which is the right option for you. Complete abdominoplasty Tummy Tucks. Your abdomen will be cut from hipbone to hipbone in this procedure, the option for those patients who require the most correction. The incision will be made low, at about the same level as your pubic hair. Partial or mini abdominoplasty tummy tucks. Mini-abdominoplasties are often performed on patients whose fat deposits an loose skin are located below the navel and require shorter incisions. If you have any questions regarding an Abdominoplasty or Tummy Tuck at our San Francisco office, or wish to schedule a consultation with Dr. Rajagopal, in San Francisco, California, please call the San Francisco Plastic Surgery & Laser Center at 415-392-3333.